I gasped as I woke up looking at the time. I cradled myself again because I had another nightmare. Same one, but more terrifying. I hopped out of bed and threw my clothes on. It was only four in the morning yet perfect temperature for a ride. I ran downstairs and popped the door open. I ran out into the barn and turned the lights on. All the horses popped their heads out. "Hey you guys!" I said cheerfully. "Who wants to go ride'n!" I walked by my mares stall, Blaze. I walked in. "Girl, you need to have that baby you are way over due." I rubbed her stomach and felt a kick. I laughed. She nickered. I gave her a kiss and walked out. "Hey buddy!" I said to my blue roan gelding. "You ready to go!" I ran to get a halter and brought it back. I saddled him up and walked out. He knew what we were doin. He eagerly set toward the barrels. I nudged him to a trot and opened the gate to the arena and grabbed my hat. I always set it on the pole. "Woe." I said firmly. I stared at the barrels. His ears twitched with excitement waiting for me to yell, go. I sat there for a couple more seconds then yelled, "GO!!!" He took off fast as a bullet how I loved the wind in my face. "Whoa!" I said he slowed to a fast lope. I yelled, "GO!" He ran toward the next barrel my hands were firm on the reins but I knew I could've let go and he would know the whole course. "Whoa!" He slowed again to a fast canter. "Get!" I yelled. His feet were steady as he ran. 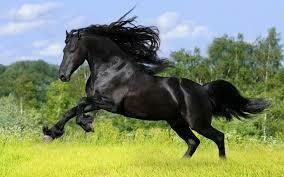 His four hoofs beat with grace yet with speed too. "Whoa." I said firmly again. Then I kicked tell the finish and said, "Whoa." We did a slide stop. "Good boy." I said as I patted his neck. I walked him off as he breathed heavily through the walk. "Alexis!" I looked back behind me and saw my mom. I kicked buddy right to her he was unsure of what we where doing but followed my commands. My Mom jumped out of the way. I ran out into the wild not sure of what was to come Soon I slowed Buddy down and looked into the light. The sun was just halfway set and I was guessing it was about five in the morning. I made buddy lay down and slowly fell asleep on him. I woke up with the sound of hoofs. I slowly opened my eyes and saw a blurry black figure in the distance. I slowly found out it was a horse. "Good thing we brought a rope." I said to buddy. He stood up and I saddled him and got on. "Lets go!" I yelled. He ran anxiously trying to catch up with the black horse. We came near and I swung my rope. I caught it. "Gotcha." I said.I slowed it down and gasped at the horse. It was beautiful! It bucked and reared. I struggled with it and slowly got it back to the barn and in the round pen. I looked it in the eye and turned around and my mother was right in front of me. Thanks i love your book! I have another book too it is called damage. i love your book thanks for the comment i am trying to get some extra time to write the second chapter but never have time so hang in there. Good Job Sadee. Just a tip you should capitalize Buddy's name. Good Story though. Can't wait for the next one (:.